Six members of the SoxProspects staff have made their way down to Fort Myers for the annual Spring Training trip. They will be providing the most detailed coverage of all the Red Sox minor league news during their time in the Fort, so be sure you are following along both on Twitter and our News Page. The six staff members in attendance are Editor-in-Chief Mike Andrews, Director of Scouting Chris Mellen, Managing Editor Matt Huegel, Senior Columnist Jon Meoli, Northeast Scout Ian Cundall, and Digital Correspondent Jonathan Singer. Andrews reported on Thursday that the Red Sox have released Tyler Wilson, Zach Gentile, and Brenden Shepard. Wilson received a $300,000 bonus as a 13th round pick in the 2008 draft, but never went above Low-A Greenville in his four seasons in the system. Singer reported four more cuts on Friday, with Adalberto Ibarra, Sully Bonnelly, Richardo Betancourt, and Oscar Melendez getting released. Ibarra was a high-profile international signing, netting a $750,000 bonus out of Cuba in 2010, but shoulder injuries derailed his career, and he played in only 119 games over three seasons. Cundall has provided the first Scouting Scratch of the season, focusing on some recent international signings. Some players generating positive buzz are Tzu-Wei Lin, Manuel Margot (pictured), and Alixon Suarez. Top prospect Xander Bogaerts is back in camp after a whirlwind World Baseball Classic that saw the Kingdom of the Netherlands advance to the semi-finals. Meoli spoke with Bogaerts, who admitted that one team threw off his timing, and he is still trying to get it back. Bogaerts also spoke with Rob Bradford of WEEI.com about how he benefited from the WBC. 2012 first-round pick Brian Johnson is looking to move forward after being hit in the face with a batted-ball at Futures at Fenway last year. Huegel caught up with Johnson who talked about the injury as well as his time in Lowell. Cundall also contributed some scouting notes on the 22-year-old left-hander. After missing the 2012 season with his second ACL tear in as many years, Kyle Stroup has flown under the radar in spring training. The 6-foot-6 right-hander is back starting in minor league camp, and he is showing the same stuff that put him on the prospect map after a solid 2011 campaign. Meoli talked with Stroup about how he feels after a year off and why he kept going after a second major injury. Huegel and Executive Editor Chris Hatfield recorded a podcast last Friday discussing the biggest stories of spring training so far. It has been an interesting spring because most of the top stories are about the success of the top minor leaguers, which makes for a great discussion. There has been no shortage of Jackie Bradley, Jr. news this week, as the young outfielder continues to impress. He is batting .444 over 45 at-bats, which is the second-most at-bats in major league camp, trailing only Jose Iglesias. Rob Bradford is reporting that Bradley is still in play for Opening Day, but John Farrell added another wrinkle this week, saying he does not view Bradley as a left-fielder, according to Brian MacPherson of the Providence Journal. If David Ortiz and Stephen Drew both start the season on the disabled list, there would be a need for a left-handed bat in the lineup, which would make it easier to pencil Bradley in. However, Bradley only hit .228 in 149 at-bats after the All-Star break in Portland last season, so people thinking he will hit .300 in the majors this season should temper their expectations. With Drew just starting baseball activity as he recovers from his concussion, it is looking very likely that Iglesias will be the Opening Day shortstop. Bradford continued his excellent coverage this week, detailing how Iglesias got to this point. MacPherson also discussed how Iglesias' stay-the-course approach is paying dividends. 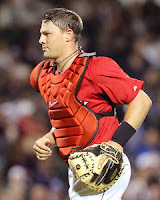 While the 25-man roster is still being sorted out, one thing that seems certain is that Ryan Lavarnway (pictured) will be the starting catcher in Pawtucket. While he could be growing impatient, Lavarnway told Scott Lauber of the Boston Herald that he is looking forward to playing every day, as he does not picture himself as a part-time player at this point in his career. Bryce Brentz had a rough start to the 2013 season after accidentally shooting himself in the leg, but he returned to camp this week, and even hit a home run in his first game back. Brentz discussed what he took away from the incident with Peter Abraham of the Boston Globe, and said he feels everything is finally back to normal. Gordon Edes of ESPNBoston is reporting that Drake Britton could face up to one year in jail after being arrested for driving under the influence. Not every fan realizes how important developing young talent is to the success of an organization. John Tomase of the Boston Herald wrote an article explaining how this next wave of young talent can be as good as gold. To say Shaq Thompson struggled in his professional debut would be an understatement, as he went 0-for-39 with 37 strikeouts. He went to the University of Washington in the fall where he starred on the football field, and many people assumed he would never return to baseball. He is back this week for 10 days during his spring break, and Alex Speier of WEEI.com talked with him about what drew him back to the baseball field. In one of the strangest moves so far this season, the Red Sox traded for 26-year-old infielder Mike Flacco in exchange for cash considerations or a player to be named later. Flacco, who played for the Orioles, will leave both Baltimore and his brother Joe behind. As we get closer to the end of Spring Training, the Red Sox are doing some of their final reassignments. Yesterday, Chris Carpenter, Terry Doyle, Chris Hernandez, and Oscar Villarreal were all assigned to minor league camp. It is still too early to tell if Rule 5 picks Josh Fields and Ryan Pressly will be returned to the Red Sox. Fields has struggled with his control this spring, walking six and striking out only four in 7 2/3 innings. He has done a good job of limiting the damage as he has only allowed three earned runs. Pressly has been very successful for the Twins, allowing only one run in 10 innings of work. Several minor leaguers who are not in big league camp appeared in game action this week. Some of the players started in major league camp but have since been reassigned. Garin Cecchini, Heiker Meneses, Derrik Gibson, Blake Swihart, Ryan Dent, Matty Johnson, Ronald Bermudez, Chris Martin, Sean Henn, Christian Vazquez, Marco Duarte, Keury De La Cruz, Dan Butler, Travis Shaw, and Jonathan Hee all appeared in at least one game this week. For anyone heading down to Fort Myers to check out the minor league action, Staff Writer Kevin Pereira has put together the game schedule.